One of the most powerful ways to target groups of customers is by those who took a specific action on a certain date or within a specified date range. Target customers by subscription date, how they are engaging with your emails, or what they have purchased. When selecting date ranges in the Listrak filtering system, there are six different choices for specifying the date range. Equals: The date a specific action occurred must match the date in your filter exactly. Does Not Equal: The date a specific action occurred must be any value other than the date in your filter. Is Before: The date a specific action occurred must be before the date in your filter. Is After: The date a specific action occurred must be after the date in your filter. Is Between: The date a specific action occurred must fall within the range specified in your filter. Data from today is not included in this filter. Is Not Between: The date a specific action occurred must not fall within the date range specified in your filter. Data from today is not included in this filter. Select your dates using two different methods: picking a static date or using an offset. 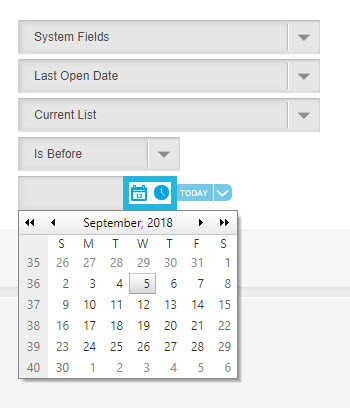 Static Dates: Use the calendar and clock icons to select a date and time. This option specifies the behavior that has or has not occurred since a specific event, such as an email being sent or a holiday. 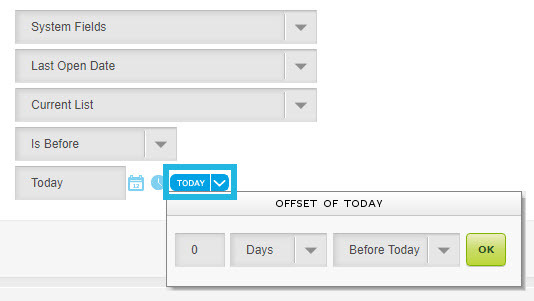 Offset: Click the arrow icon next to Today to use the offset option. Using an offset allows the time frame to be adjusted based on when an email is sent. For example, an offset of 1 week before today will calculate the 1-week window on the date the email is sent. TIP: Use this option to allow flexibility in moving the message on your marketing calendar. Date filters allow you to segment contacts based on if they have or have not taken a certain action in a given time frame. For example, you only want to send a message to those who last opened an email between 60 and 90 days ago. 2. 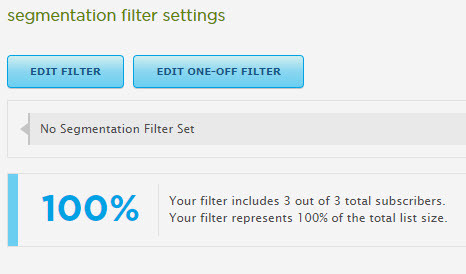 Navigate to the Segmentation filtering section. 4. Select System Fields from the first drop-down menu. System fields track email engagement for all messages sent from Listrak. 5. Select Last Open Date from the second drop-down to narrow down the list of contacts based on when they last opened an email. 6. Next, select if you want to include only the Current List or All Lists. 7. Select Is Between from the next drop-down. Is Between allows you to specify a range of dates during which the specific action must have occurred. 8. Click the arrow next to the first input field. 9. Enter 90 Days to the first box. 11. Click the arrow next to the second input field. 12. Enter 60 Days to the second box. 15. Select Apply Filter to add the filter to your message.